Register now for the Advanced Summer Programme on terrorism, counter-terrorism and the rule of law organised by ICCT and T.M.C. Asser Institute from 26 August to the 30 August 2019 in The Hague. From 26 – 30 August 2019, ICCT and T.M.C. 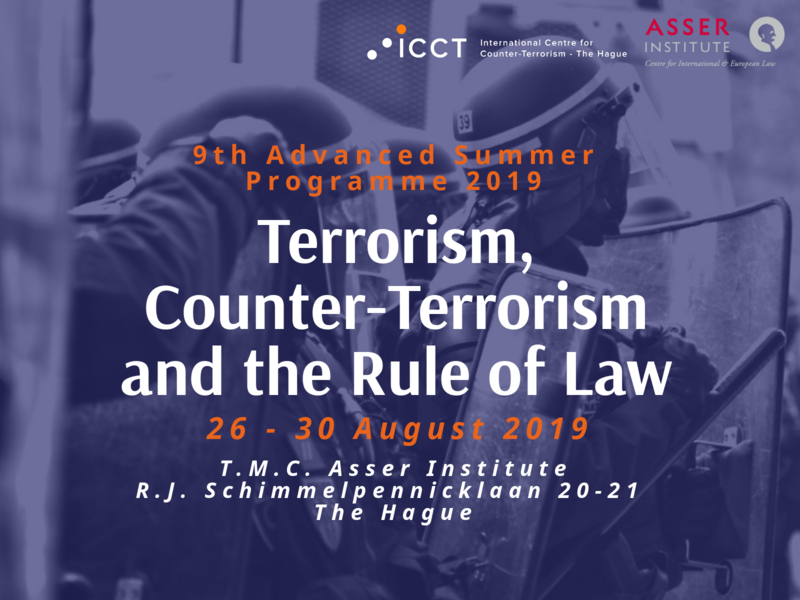 Asser Instituut in The Hague will host the ninth Advanced summer programme on terrorism, counter-terrorism and the rule of law. During an intensive week, experts, academics and practitioners will explore international and domestic legal aspects of counter-terrorism. You will get the chance to have a unique and in-depth look at the challenges that come with adopting and implementing counter-terrorism measures, while ensuring respect for human rights, fundamental freedoms and the rule of law. Our renowned summer programme will bring you lectures by top speakers in the field, interactive sessions, study visits, group discussions (Chatham House Rules) and panel presentations on current topics. Key topics: Latest developments in the legal aspects of terrorism & counter-terrorism, administrative and security measures, domestic and international law dilemmas, use of intelligence evidence in counter-terrorism cases, prosecutorial challenges and impact of counter-terrorism on human rights. Target group: PhD candidates, national and international experts, security services, policy makers, practitioners and early career academics currently working in the field of counter-terrorism or aiming to. The aim of this Summer Programme is to give you all the necessary tools for successful implementation of international and domestic legal aspects of counter terrorism in their daily practice. It will provide you with comprehensive knowledge of the legal fundamentals of counter-terrorism and extremism through interactive study of both the relevant legislation and case law. The course will combine presentations, practical workshop activities and field trips, all led by high-level experts in the field. Terrorist attacks have triggered an increase in security-related legislative provisions across the world. A wide range of new or updated administrative and criminal law measures is meant to bolster states’ ability to respond to acts of terrorism, and to address perceived ‘gaps’ in domestic legislation and security strategies. In trying to pre-empt terrorism related activities as early as feasible, states have further introduced additional preparatory and inchoate offences, curbs on financial and other support, limitations on the scope of the right to freedom speech and others. But how proportional and legitimate are these measures? And are they effective? Prosecutorial challenges, administrative and security measures. To register for the summer programme, please fill out the registration form. Please read the registration terms & conditions carefully before registration. For inquiries on registration and the programme, please contact educationtraining@asser.nl. Prior to this summer programme, participants have the opportunity to enrol in a complementary summer programme that focuses on preventing violent extremism. This programme is organised by the Centre for Professional Learning of Leiden University and ICCT. The early bird fee for the first five professionals to attend both summer programmes is €2595,-. The early bird PhD candidate fee for the first five entering the two summer programmes is €1890,-. The standard fee for entering both summer courses is €2790,-. Should you wish to register for the combined summer programme discount package, please contact learning@fgga.leidenuniv.nl. For any other inquiries related to the rule of law component, please contact educationtraining@asser.nl.